Did Concussions/TBI Trigger Dale Earnhardt Jr.’s Retirement? The ‘Pied Piper’ of Daytona, Dale Earnhardt Jr., has decided to retire from NASCAR racing at the end of the 2017 season. Some think he’s cutting his career short. Others wonder if a series of crashes and injuries over the past year or so may be to blame. On June 12, 2016, Earnhardt Jr. crashes at the Michigan International Speedway during the 62nd lap of the FireKeepers Casino 400. He reportedly felt fine after the race and, consequently, participates in the next 3 NASCAR races. Later, his doctor explains that this crash caused Earnhardt Jr. to sustain a season-ending concussion. On July 2, 2016, Earnhardt Jr. crashes at Daytona, hitting No. 48 car head on. This seemed to be a harder-impact crash than the one at the FireKeepers Casino 400. On July 14, 2016, Earnhardt Jr. announces he’ll miss the New Hampshire 301 race. At this time, he reportedly is experiencing equilibrium issues affecting his balance. Though he thought these problems were related to “severe allergy symptoms,” doctors explain that the symptoms are due to a concussion. Subsequently, Earnhardt decides to take himself out of the New Hampshire Motor Speedway’s summer racing event. On July 17, 2016, Earnhardt Jr. takes to his weekly podcast to explain his condition to fans. This is reportedly the first time that Junior emphasizes his commitment to not rush his recovery. On July 20, 2016, Hendrick Motorsports (HMS) announces that Earnhardt Jr. will not participate in the Brickyard 400. Instead, four-time NASCAR Cup Champion Jeff Gordon will come out of retirement to replace Junior in this race, HMS explains. On August 2, 2016, HMS announces that Gordon will again replace Earnhardt Jr., this time in the Cheez-It 355 at The Glen. To say I’m disappointed doesn’t begin to describe how I feel, but I know this is the right thing for my long-term health and career. I’m 100 percent focused on my recovery, and I will continue to follow everything the doctors tell me. On December 8, 2016, Earnhardt Jr. is cleared by his doctors to resume racing in 2017. Junior reportedly earned this clearance by “passing” a private 185-lap driving test at Darlington Raceway. 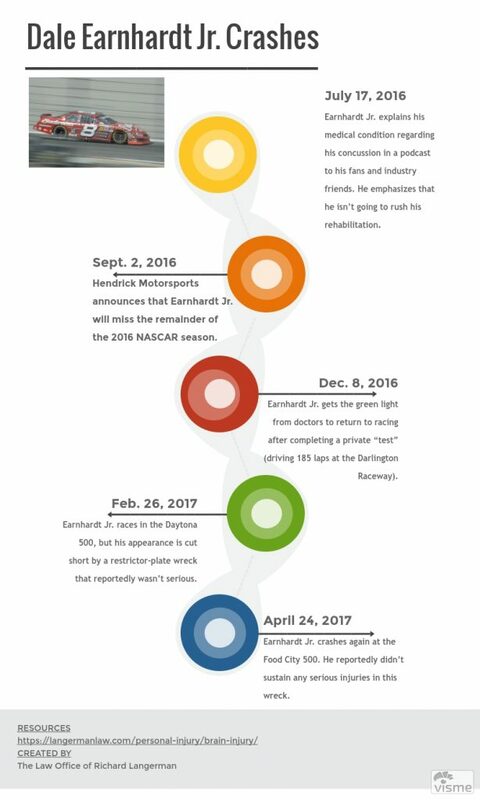 On February 26, 2017, Earnnhardt Jr. competes in the Daytona 500. This return was cut short, however, by a restrictor-plate wreck. Junior reportedly did not suffer any personal injury in this car crash. On April 24, 2017, Earnhardt Jr. wrecks at Bristol Motor Speedway in the Food City 500. The wreck occurred during the first lap of the final leg of the race. Junior reportedly didn’t suffer injuries in this crash. On April 25, 2017, Earnhardt Jr. announces his retirement after the 2017 NASCAR season. This timeline seems to suggest that concussion-related health issues, possibly coupled with a waning winning streak, played a role in Earnhardt Jr.’s decision to retire. In March 2016, Earnhardt Jr. announced his decision to donate his brain to science. This decision reportedly came after Junior had time to process the impacts of two concussions he sustained within six weeks (in 2012). Junior’s last season echoes the final seasons of other major sports figures (especially from the NFL), who chose to retire after significant injuries, like concussions (and more serious traumatic brain injuries or TBIs). Over his storied career, Earnhardt Jr. started in a total of 603 races, finishing in the top 10 in 253 races. His most illustrious finishes include 26 NASCAR race wins, two of which were at the lofty Daytona 500 (in 2004 and 2014). During my rehabilitation, I was given something that I wasn’t accustomed to, and that was time – time to understand what’s important to me, time to realize the incredible support system I have. I’ve accomplished way more than I ever dreamed. So I’m good on that front. My heart loves being in the car. I love driving. I enjoy it as much as I ever have. It’s really emotional. A Word about Concussions & TBIs: How Serious is a Concussion? A cumulative impact on the brain, meaning that multiple concussions can cause an increasing amount of damage – Some research has even linked multiple concussions to an increased risk of chronic traumatic encephalopathy, CTE (a debilitating degenerative brain disease). Latent for a certain period – The signs of concussions may not arise for hours or even days after the event that caused it. That can make it challenging to recognize and diagnose this mild TBI. Generic – Concussions can have symptoms that may mirror other health problems, further complicating proper diagnoses (and prompt treatment). Concussions are like snowflakes. There are no two concussions that are the same. Each one deals with certain parts of the body and to be able to use that impact test helps you understand how to treat that particular concussion. I think the protocols and the advances that we have made in trying to protect ourselves are great things. I’m excited about what NASCAR has done. They have really taken this head on. They are talking to the right people. They are talking and involving themselves with the right folks to get the best information to be able to protect the drivers the best way they can. … It will just get better the same way everything else in the sport progresses.